Patients with special dietary needs or those with diseases of the gut/pancreas often find themselves frustrated and in tremendous pain. Figuring out how to calm down the immunological response of the gut may make it possible to create a treatment for gastro diseases and disorders, and it turns out part of the solution may be found in both chili peppers and cannabis. 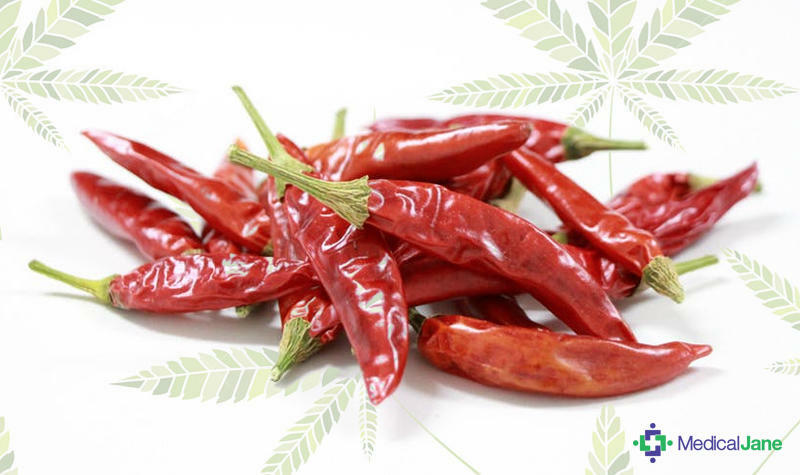 You wouldn’t think chili peppers and cannabis have much in common; but researchers have now found that the chemical that gives chili peppers their heat targets a receptor in the gut that produces a compound called anandamide, which is chemically similar to some of the compounds found in the cannabis plant, and one which our body already produces. A recent study published in the Proceedings of the National Academy of Sciences (PNAS) connects the nervous system to the maintenance of an immune-tolerant environment in the gut, one of the most fundamental properties of the immune system. In other words, your nervous system is not only responsible for sensing exogenous cannabinoids (such as those found in cannabis) and endocannabinoids (found in your body), but it is also one of the main drivers for keeping your gut healthy. Earlier experiments had proven that immune cells became highly activated when exposed to hot temperatures, causing the immune cells to get to work and do their job. Studies have shown that fevers can help immune cells work better, but why? If physically hot temperatures activate the immune cells, would the chemical that makes chili peppers feel hot do the same? You barely need to touch a chili pepper to your lips before your brain begins to sense its heat. This is because the pungent molecule in chili peppers, known as capsaicin (CP), binds to a receptor that triggers a nerve to fire off a signal to your brain letting you know that it is hot. To answer their questions, a group of UConn researchers led by Pramod Srivastava, professor of immunology and medicine at the UConn Health School of Medicine, fed capsaicin (as found in chili pepper) to mice with type 1 diabetes. Type 1 diabetes, like other gastrointestinal disorders such as irritable bowel disorder, stems from autoimmune inflammation. Because heat and capsaicin (CP) tend to make immune cells more active, the mice fed CP should have developed more diabetes than the control group. However, the opposite occurred. The CP didn’t ramp up the immune cells in the guts of the mice, but instead chilled them out and the inflammation in their guts lessened. Even more amazing, the CP-fed mice were no longer diabetic; the CP seemed to stimulate their bodies’ natural production of anandamide. Researchers observed that anandamide (AEA), an endogenous intestinal cannabinoid that controls appetite and energy balance by engagement of the enteric nervous system through cannabinoid receptors actually helped calm down the immune system in the guts of mice. These results give promise that AEA could eventually help in maintaining immunological health in the human gut, but research is limited. Exogenous cannabinoids such as those found in cannabis exert their influence through cannabinoid receptors. Endogenous cannabinoids (endocannabinoids) such as AEA function through the same receptors. These results uncover a major conversation between the immune and nervous systems. “This allows you to imagine ways the immune system and the brain might talk to each other. They share a common language,” said Prof Pramod Srivastava — AEA is the one thing they have in common. Srivastava and his research colleagues aren’t sure how or why AEA might relay messages between the immune system and the brain, but they have figured out how it heals the gut. Unlike the rest of our body, the immune system in the gut actively tolerates foreign toxins and substances as opposed to seeking them out and destroying them. Tasked with the responsibility of fueling our body, the stomach cannot afford to discriminate and welcomes these foreign invaders in the form of food. But when our gut’s immune system starts acting more like that of the rest of the body, it gets inflamed and starts attacking itself, resulting in illness. The UConn study showed that AEA and its receptor, cannabinoid receptor 2 (CB2), assisted in the regulation of immune tolerance in the gut and pancreas, and contributed to this critical process by promoting the presence of a special kind of immune cell, CX3CR1. When they looked carefully at what was happening at a molecular level, the researchers saw that CP has a similar effect as AEA; however, it was binding to the vanilloid receptor TRPV1, which is found on specialized cells throughout the gastrointestinal tract. When CP binds to it, TRPV1 causes cells to make AEA, which acts through CB2. They also discovered that a special kind of immune cell, known as CX3CR1, was activated in the CP-fed mice. CX3CR1 tends to suppress immune responses in the gut and recruits a type of macrophage, a large phagocytic cell found in stationary form in the tissues or as a mobile white blood cell, especially at sites of infection, that reduces inflammation. But since most of us cannot tolerate eating chili peppers to get the benefits of CP, the researchers sought out other sources that may bind to the same calcium channel as CP. They discovered that oral administration of AEA did just this. Anandamide, also known as N-arachidonoylethanolamine or AEA, was discovered in the 80s. AEA is an endogenous analogue of tetrahydrocannabinol (THC). AEA has an effect on both the CB1 receptors (more in the central nervous system) and CB2 receptors (more in the periphery). The UConn researchers then orally administered AEA to the mice and the results were amazing. The AEA-fed mice experienced incredible healing effects, namely stretching from the esophagus down through the stomach, the same as the CP-fed mice fed. In both cases, it was ultimately the AEA that was healing the gut, which suggests that other cannabinoids like those found in cannabis might have a similar effect in the gut. As with all cannabis-related studies, there are limitations. Although the present study was performed using mice instead of humans, the results suggest interesting possibilities. AEA is a heavily regulated substance. As a result, researchers hope to work with public health authorities in Colorado to see if legalization has led to any improvement in colitis patients who consume edibles. If it has, such evidence could help make the case for a study that repeats the experiment in human patients to show that anandamide or other cannabinoids such as they found in cannabis could be used as therapeutic drugs to treat certain disorders of the stomach, pancreas, intestines, and colon. Human cells aren’t exposed to capsaicin directly, so hold off on eating massive amounts of hot peppers or chugging hot sauce as a way to boost your body’s AEA production. Spices typically increase acid secretion in the gut and reduce the strength of the gastritis mucosal barrier. But if you have access to legal cannabis, you may want to experiment to see if ingesting it can help with gut problems. Acharya, Nandini, Sasi Penukonda, Tatiana Shcheglova, Adam T. Hagymasi, Sreyashi Basu, and Pramod K. Srivastava. “Endocannabinoid system acts as a regulator of immune homeostasis in the gut.” Proceedings of the National Academy of Sciences 114.19 (2017): 5005-010. Web. Nevius, E., P. K. Srivastava, and S. Basu. “Oral ingestion of Capsaicin, the pungent component of chili pepper, enhances a discreet population of macrophages and confers protection from autoimmune diabetes.” Mucosal Immunology 5.1 (2011): 76-86. Web. Basu, S., and P. Srivastava. “Immunological role of neuronal receptor vanilloid receptor 1 expressed on dendritic cells.” Proceedings of the National Academy of Sciences 102.14 (2005): 5120-125. Web. Chen, Jie, Angelika Varga, Srikumaran Selvarajah, Agnes Jenes, Beatrix Dienes, Joao Sousa-Valente, Akos Kulik, Gabor Veress, Susan D. Brain, David Baker, Laszlo Urban, Ken Mackie, and Istvan Nagy. “Spatial Distribution of the Cannabinoid Type 1 and Capsaicin Receptors May Contribute to the Complexity of Their Crosstalk.” Scientific Reports 6.1 (2016): n. pag. Web.